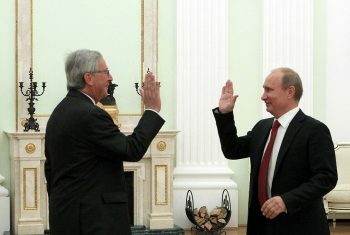 EU-Russia • Specific Co-operations or Global Partnership? In the context of a new world order where, among others, the US is rethinking its foreign policy and advancing American interests and China is securing its new status as superpower, isn’t it time for the EU to realize that it needs to strengthen its own position? Wouldn’t an improved relationship with Russia now it is back on the world stage, be a coherent way to achieve this objective despite the challenges involved? This could initially take the form of specific areas of cooperation which would eventually come to some kind of partnership. Wouldn’t such an approach lead to a strong entity having the ability to punch its weight between America and Asia? Several factors are likely to change the world order: the challenge to the American leadership, the accession to power of individuals violating the established rules, the world’s economic center of gravity shifting to the East and the rising power of China, an increasing mistrust towards political leaders and growing violence worldwide. The US leadership. Will the US still assume the world leadership in the fields of security, liberty and prosperity, that goes beyond its pure national interests? Will America still consider itself as a global superpower having the means capable of shaping the world for good? Will America still believe it is an exceptional and indispensable nation having the ability to be a force for peace and progress and being a champion for freedom opportunity? In any event, the size of US public debt (USD 22 trillion by 2020) will constrain the American President to restrict the use of military actions and to delegate as often as possible the war burden to allies (the mantra being: to win the war by ideas). America is expected to be more pragmatic than in the past. The US is likely to deal with what it sees and not with what it hopes. In any case, if the world’s leading liberal democratic nation does not assume its role as world’s rogues will try to fill the breach often in league with one another. The accession to power of rule breakers. Vladimir Putin is one of them. His successful political trajectory was unpredictable. However, his strategy is more predictable. What matters for him is to achieve his goal of making Russia a great power again, to secure his country stability and prosperity and to control information even through hard power. Russia maintains the second most powerful military in the world and spends more than 5% of its weakened GDP on defense (against 5.5% until recently in the US and 3.5% in 2016). In another way, President Trump is also a rule breaker. Donald Trump’ victory was a symptom of the breakdown of the post-World War 2 order. So far President Trump seems far more likely than any other of his predecessors to accelerate, rather than resist, the unwinding of the post-war order. The transatlantic axis is moving to the East. More than half of the humanity is concentrated in an area centered somewhere between China and India, on 1/6th of the planet’s land, encompassing China, Japan, Korea Indonesia and India. Those countries are far outside of the transatlantic axis. China fast growing economy is about to overtake, sooner than foreseen, the US which has been the world’s leading economic power for more than a century. During the last decades, China also succeeded in reducing inequalities thanks to impressive job creations. The change of the world’s economic center of gravity resulted in a shift in trading. Germany is in that respect a point in case. Instead of exporting mainly to its neighboring countries and to the US, it is selling more and more to China and to the rest of developing Asia and so continues to be the most successful economy of Europe despite the poor performances of the other EU member states. To what extent could this change of paradigm affect European relationship with the US more so that America could be more concerned in the future by its national interests than by global leadership? Power and violence. In many parts of the world, power is not or no more the ability to act in concert or generated through persuasion and demonstration, but it evolves to the property of a single actor, individual or institutional, resorting to violence whenever necessary to serve its purpose. In such a scheme, justification is superfluous. The return of Russia on the world stage. Vladimir Putin has engineered Russia’s return to global power. The Russian Federation is gradually but surely reclaiming some of its last influence on the world, particularly in West Asia and North Africa. Moscow’s realpolitik opportunism has proved successful so far. Moscow appears to accumulate successes on the international stage. As Mark Entin put it, strong stereotypes and prejudices have routed in the common consciousness, preventing to have an impartial picture of Russia and the EU ( ). The distortion of reality is pervading political practices although only the perspective of more friendly relations between Moscow and Brussels can ensure security, stability prosperity and competitiveness on the continent. Russia and the EU are not only geographical neighbors. They belong to the same family of European peoples. Ostracism of Russia is obviously not the solution. if such specific cooperation is successful, developing a more global partnership?